The iPhone 6s and the iPhone 6s Plus are more powerful than the Huawei Nexus 6P, Xiaomi Mi Note Pro, Samsung Galaxy S6 Edge+, the OnePlus 2, or any other Android smartphone launched in 2015, as per the latest benchmarking statistics. In a new report released by AnTuTu detailing the Top 10 Devices of 2015, Apple’s flagship smartphones have been found way ahead of its competition. 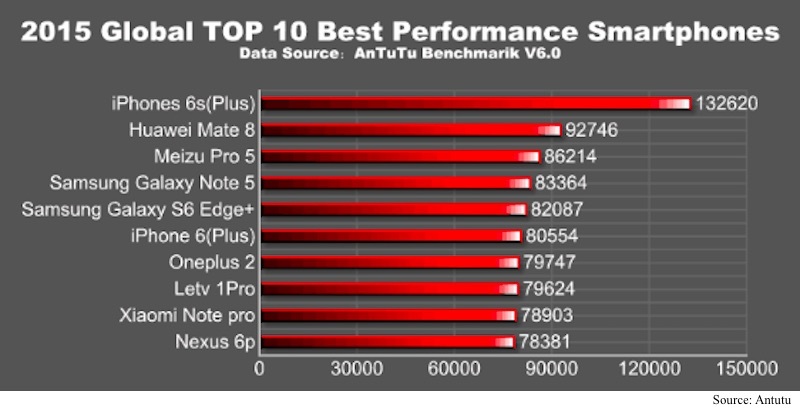 Popular benchmarking service AnTuTu released its yearly report on Wednesday, noting that in its assessment, the iPhone 6s Plus and the iPhone 6s were found to be substantially more powerful than any of its competitors. In fact, the iPhone 6s (or the iPhone 6s Plus, since both are largely identical) is 41 percent more powerful than the Huawei Mate 8, the most powerful Android smartphone. The version 6.0 of AnTuTu, which now supports cross-platform benchmarking, gave iPhone 6s a score of 132,620. Compared to this, the Huawei Mate 8 scored 92,746 while the Meizu Pro 5 had 86,214. TheSamsung Galaxy Note 5 had a score of 83,364, the Samsung Galaxy S6 Edge+ a score of 82,087, while the iPhone 6 found itself with 80,554 points. The OnePlus 2 could only get 79,747. To understand why an iPhone has so much processing muscle, we must realise that it doesn’t run Samsung’s Exynos or Qualcomm’s Snapdragon line of processors like most of the Android smartphones. Instead, the iPhone 6s has Apple’s custom-made dual-core A9 SoC. To make things more amusing, the iPhone 6s Plus has 2GB of RAM, while many of the competitive Android handsets have 4GB of RAM. To note however, is that there are few cross-platform benchmarks available for both Android and iOS devices, making comparisons difficult in most cases.